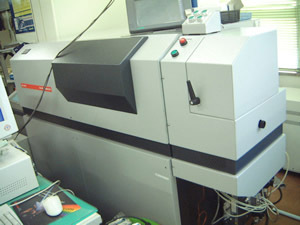 [Emission spectrophotometer] Daido Bunseki Research Inc. 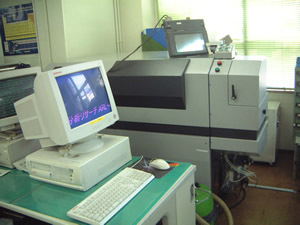 Principle Sparks are discharged between analysis sample (conductive property required) and tungsten electrode in vacuum. Light generated when this occurs is dispersed to each wavelength (spectrum), and the light intensity is measured. Mainstream of iron and steel analysis.